The seat (with occupants) at the junction of Fisher Lane. Victoria Lodge is just visible in the centre of the photo. 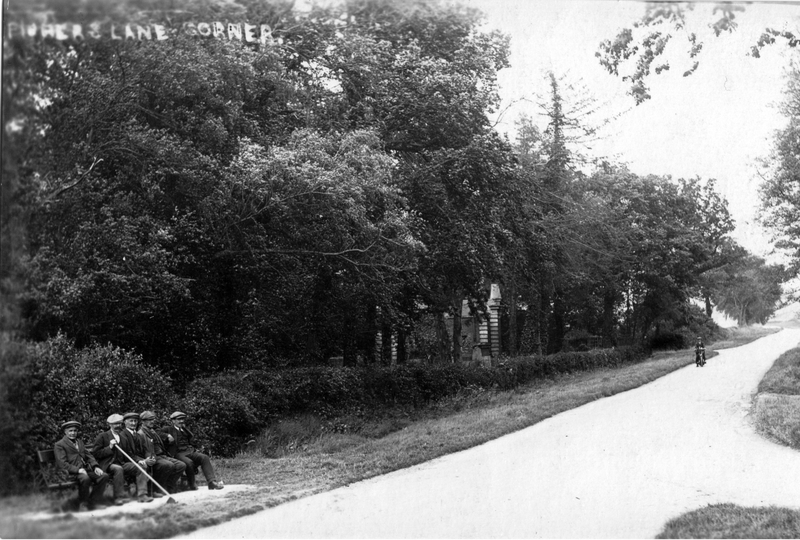 The photo above shows the seat that once provided a resting place on Hillside (Cambridge Road) for local ex servicemen and pensioners. Victoria Lodge is just visible in the centre of the photo.The following newspaper report (in italics) from about 1920 explains how the seat came to be there. Through the generosity of Mr G. Breed son of this parish a long seat has during the past week been placed amongst pleasant surroundings at the end of Fishers lane. Primarily it is intended for the use of wounded soldiers and old aged pensioners who wish to take this opportunity of thanking Mr Breed for his kindly thought in meeting an oft expressed need. For strength and duration it is placed on a concrete foundation and is the successful work of Messrs. E. and A Merry of this parish. When the seat at the bottom of Fisher's Lane was damaged, the Parish Council in its wisdom felt it was too dangerous a position in which to replace it, so it was re-sited on the opposite side of the road It may no longer be there but the memory of the conversations and stories on and around that seat still linger on. Editors note. The seat was damaged in 1953/4 by a Camtax vehicle and was out if use until it was repaired. It also seems that the seat was damaged on a number of occasions. 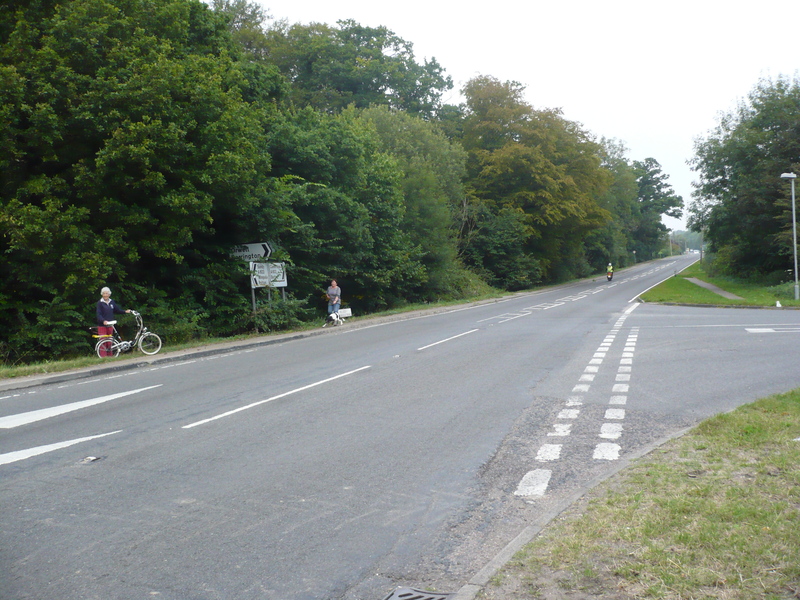 By 1978 the seat was no longer there and was not replaced possibly because of the increase in traffic. For example, Mr Joe Prime, a great character in this village for many years, made use of the seat on which to relax for the odd hour and one of these times was on a Sunday morning. It so happened that a certain Major Hall, then living in the village, liked to take a walk and took a rest on the seat and took up a conversation with Joe. Now this went on for a week or so and the Major noticed that the moment the church clock struck the first note of 12:00 noon Joe would jump up and say, ‘I must go’, his intention being to visit one of the four locals that were in the village at the time for a pre-lunch pint. The Major took it upon himself to question Joe as to why he had to rush off so quickly the moment that he heard the clock strike. Joe very carefully explained that when he was a small boy he had swallowed a cork and he had been told never to let it settle or it could be fatal! 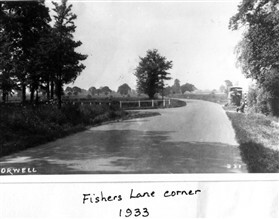 Distant view of the seat, at the corner of Fisher Lane. The Major’s reply was ‘Oh dear, oh dear,’ which was no indication as to whether he believed the reason given for the hasty retreat or not. This page was added by Pat Grigor on 26/02/2013.